On the second day of the Google Cloud Next event, Google pointed out that the cloud collaboration and job application suite G Suite already has 5 million business users. It includes well-known media, retail, manufacturing, and government agencies, educational institutions and other enterprises or organizations. These include Netflix, Spotify, and more. Google G Suite includes Google Gmail, Google Drive, Google Hangouts, Google Calendar, Google Docs, and more. Among them, Gmail users exceeded 1.5 billion, and Google Drive exceeded 1 billion. Google has never announced G Suite revenue figures, but some US analysts pointed out that G Suite accounted for more than 50% of Google Cloud’s overall revenue. Google had pointed out in early 2018 that Google Cloud’s revenue in the fourth quarter of 2017 had exceeded $1 billion. 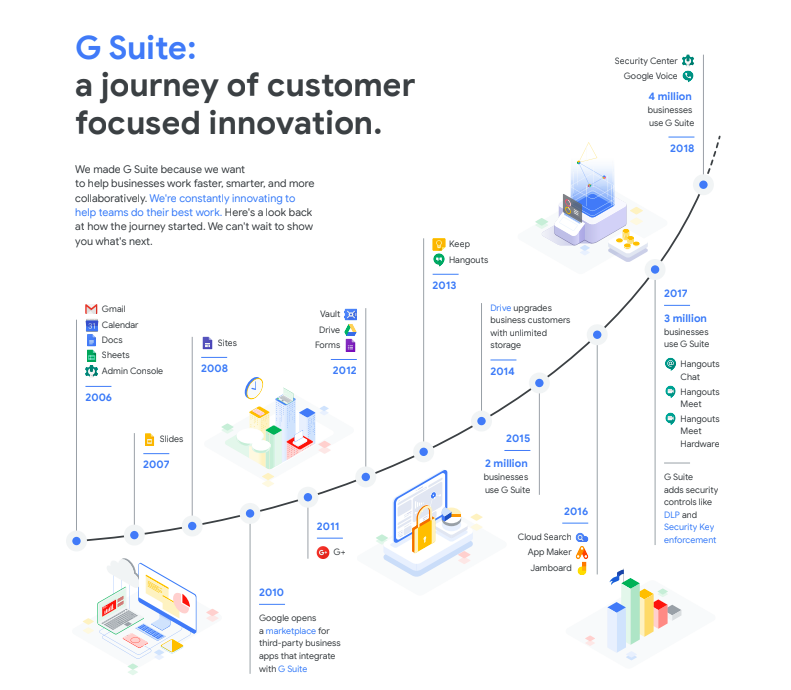 In the past, G Suite was particularly competitive in terms of price, so it was influenced by organizations such as start-ups, individual studios, or short-term mission projects. In the past two years, it has increased the number of millions of enterprise users. In 2017, it was only 3 million. Corporate users grew to 4 million in 2018 and exceeded 5 million this year (see the figure below). G Suit has increased in the past two years by increasing the number of corporate users. But after breaking through 5 million, Google immediately announced the price of G Suite. First, on behalf of the enterprise market has reached a certain milestone, and at the same time, it shows the intention to upgrade the services of large enterprises . Since G Suite’s large enterprise penetration rate is far less than that of Microsoft, Google will attack the service of cross-border cooperation and development of 5G mobile workers. Openness is the focus of this Google Cloud strategy. It can be found in many Cloud products that Google has rapidly expanded its ecosystem through openness and cooperation . The same is true for G Suite. For example, in the past Google Cloud search function, it was limited to collecting its own services, namely Gmail, cloud hard drive, files, spreadsheets, newsletters, calendars, etc., but this time the conference broke the border, once and up to 60 Business cooperation. These companies are very broad, from competitors’ storage solutions, such as Amazon S3, Box, Microsoft OneDrive, etc., to databases, Oracle, MySQL and PostgreSQL, as well as collaboration solutions Atlassian Confluence, Jira and Microsoft Sharepoint, and even Salesforce, SAP. ERP and sales support systems such as ServiceNow can be searched. IDC predicts that 5G will have an opportunity to reach 26% of total mobile phone shipments in 2023 (as shown below). When the mobile phone enters the 5G era, the advantages of Google G Suite in the field of action are more obvious. Why do you say that? 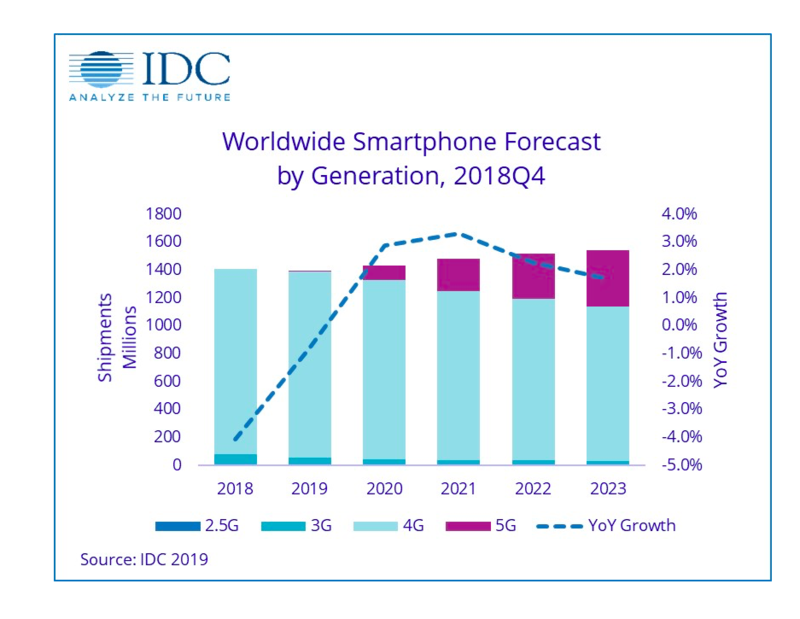 “5G will have a better connection. Face-to-face workflows such as video and live broadcast will be more popular. On the other hand, 5G will bring more opportunities for Machine Learning, and workers will be more Relying on the use of cloud servers for forecasting, more dependent on cloud intelligence,” said Garrick Toubassi, vice president of Google Cloud Engineering. Mobile devices such as PCs and mobile phones are also very different in terms of work behavior. “In the PC era, people spend more time thinking about how to fully express themselves, but in the era of action, workers’ documents and content are getting shorter and shorter and content production is getting faster and faster. This difference is not only for workers. I saw it, and I also observed it in the students’ habits,” said Garrick Toubassi. In this context, G Suite has placed considerable emphasis on the integration of AI and voice office this year. G Suite tightly integrates voice and social activities such as speech recognition, natural language processing, live streaming, and group chat rooms. The benefits of such integration in the mobile terminal industry will also be greater than the PC side. I hope that I can grasp the great opportunity of 5G and the hearts of large enterprise users. For example, G Suite integrates with Google Assistant, especially the features of the calendar. Users can use the Google Assistant to prepare for the day’s work or to ask for the itinerary. Google Voice uses Google’s built-in AI technology to transcribe the contents of voicemail and block spam calls. It can also reverse text into voice messages in nine languages ​​(but not Chinese). In terms of social communities, the features of Hangout Meet are updated. Provide automatic live captions via Google Voice Recognition. Previous Disney streaming audio and video service Disney+ is online on November 12th! Next Which kind of person can work in Amazon?